1. Deflation is something we associate with bad outcomes - e.g. Japan in the 1990s and the Great Depression. 2. The inflation rate is currently very low in the US, and getting lower, and it will likely enter negative territory in the near future. 3. The Fed can and should do something about this, but it is ignoring the problem. Is deflation a bad thing? Conventional monetary theory says no. Friedman's argument from his "Optimum Quantity of Money" essay is that the nominal interest rate represents a distortion which we want to get rid of. In general this implies that, on trend, prices should fall over time - trend deflation is optimal. Now, my deceased friend Bruce Smith was fond of calling the Friedman rule an embarrassment for monetary economics. All of these models are telling us the nominal interest rate should be zero forever, but no central bank actually does this. 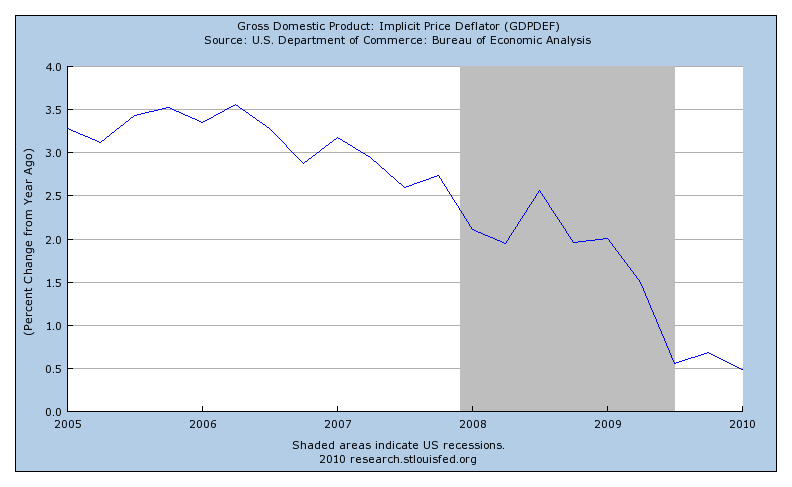 Further, as Krugman recognizes, deflation tends to be associated with bad stuff. Some theories do, however, take us away from the Friedman rule as a policy prescription. The Friedman rule corrects a long-run distortion - anticipated deflation gives money an appropriately high social return. However, New Keynesians focus on the short-run distortions that come from sticky prices. Combine this with the long-run Friedman-rule distortions and you get optimal inflation somewhere between zero and Friedman-rule deflation, but it's still an optimal deflation. I got a similar result in a non-Keynesian model with a different kind of short-run relative price distortion. A recent idea I like better, which relates to this discussion takes account of the notion that we should take currency seriously. Currency, which finances most of the central bank's asset holdings in normal times, has many direct costs and indirect social costs associated with its use - counterfeiting, theft, and various other illegal activites. Inflation taxes these undesirable activities, which is good, but inflation is also bad for well-known reasons. In any event, taking account of the costs of using currency as a medium of exchange will give us an inflation rate above the Friedman rule rate, and could indeed tell us that the optimal inflation rate is positive, and that this optimal rate could fluctuate over time. Is the inflation rate currently low and falling? 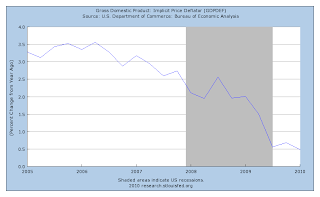 Let's look at the broadest possible measure of inflation, the rate of change in the GDP price deflator. If we look at year-over-year percentage changes in the GDP price deflator, in the chart, we certainly see a rate of change that is low and falling. Indeed, the inflation rate, measured this way, is currently at 0.5%. Why should the inflation rate continue falling? New or Old Keynesians might think that the output gap matters for the inflation rate, in Phillips curve fashion, and that the current large output gap (however measured) should ultimately produce deflation. But as Bob Hall reminded us in his Society for Economic Dynamics plenary talk last Thursday, recent output gaps appear to have had no effect on the inflation rate. Further, this evidence tells us that Phillips curve relationships are not useful for forecasting inflation. Certainly there is no quantity-theory-of-money inflation story that would cause us to forecast a further reduction in inflation to negative territory. But the message of Mr. Bernanke’s 2002 speech was that there are other things the Fed can do. It can buy longer-term government debt. It can buy private-sector debt. It can try to move expectations by announcing that it will keep short-term rates low for a long time. It can raise its long-run inflation target, to help convince the private sector that borrowing is a good idea and hoarding cash a mistake. What about that? First, the Fed has already acquired a rather large quantity of long-maturity Treasuries and agency securities, and a very large quantity of mortgage backed securities. But, Krugman wants the Fed to buy more. Would this have any effect? Absolutely not. Swaps of reserves for private or public debt under the current regime (positive excess reserves) are essentially neutral (no effect on prices or quantities). The only instrument the Fed has currently for affecting the path of the price level is the interest rate on reserves, and that cannot go much lower, as Krugman points out. Should the Fed be committing to keeping short rates low indefinitely? Absolutely not, as there are inflation risks that Krugman does not recognize. Some people are worried about the maturity mismatch on the Fed's balance sheet. Others, including John Cochrane and Chris Sims, are worried about the inflationary implications of government deficits. These concerns may be unwarranted, as I'm now making the case that Krugman's deflationary concerns are unwarranted. In any case, we're in uncharted territory, and Krugman should not be so sure of himself. 1) I think there's a recent paper by guys at SF Fed (Rudebusch? ), that basically says that output gap is somewhat useful in forecasting inflation when the gap is large. 2) I think Krugman's point is more about buying private debt. Swapping a non-AAA assets for AAA, and it does have an effect. 3) Talking seriously about Friedman rule after ridiculing sticky-price assumptions is equally ridiculous. Without a good model of why people use nominal contracts for anything at all, deriving optimal monetary policy is kinda moot. 4) Personally, I don't think there's gonna be deflation soon. And it is based on my expectation that Fin Reg is gonna pass, and since the bill is basically hapless any kind of precautionary reserve building that has been going on (both by banks and by businesses in anticipation of tightened funding via banks) will turn out to be too strong ex-post. So in that sense a weak Fin Reg bill will stimulate the economy in the short-run at the expense of the longer-term issues, but will help avoid deflation. Wall-street apparently started hiring already. Minor typo: "The Friedman rule corrects a long-run distortion - anticipated inflation gives money an appropriately high social return." Should be "deflation". Had me confused there. "In any case, we're in uncharted territory"
Sort of... In that I know of no cases of a positive outcome after being in a liquidity trap at the zero-rate lower bound. Japan is still suffering depressed growth, and the Great Depression ended with WWII. So we have some examples of what doesn't work very well. (i) The Friedman rule is certainly not ridiculous. It's a nice piece of theory, which starts you off thinking about the right things. I hope I made clear that you should not take it literally as a policy recommendation. (ii) If you won't give us permission to do monetary policy without a theory of nominal contracts, then I guess we can all go home. Such a theory does not exist. You'll have to show me why the US in 2010 is the same as Japan in the 1990s or US in the Great Depression. For me this is like comparing a duck to a goat. Sure you can do monetary policy. Just not 'optimal monetary policy'. Just like you can do it any NK model, where any 'optimal' policy is equally pointless. A quick look at the Cleveland Fed's expected inflation series or the inferred expected inflation series from TIPS are unequivocally indicating disinflation going foward. Given all the problems in the global economy (Eurozone mess, prospect of China slowing down, austerity talk, weak U.S. economic data) it is reasonable to infer that this decline in expected inflation--and there is a clear downward trend over the past 6 months or so--is reflecting a belief by the market that aggregate demand is stalling and will continue to do so for the second half of the year. By not moving to stabilize this decline in total spending the Fed is effectively tightening. There are good reasons to believe the Fed could do a lot to arrest this development if it wanted. First, fed officials believe they do more more if they were so inclined. Second, unconventional monetary policy done right is not just about the size or composition of the Fed's balance. It is also about shaping expectations (and hence velocity) and here the Fed has failed miserably. As I noted in this post, unconventional monetary policy was highly effective in the 1933-1936 recovery. Here it was effective because expectations and the quantity of money were both changed by policy. Regard deflation itself, I believe one has to be careful in assuming all deflation is harmful. Deflation, after all, can emerge because of negative aggregate demand shocks or positive aggregate supply shocks. Right now, though, it seems clear to me that looming deflationary pressurs are of the harmful kind. It's really quite staggering that monetarists make such a deal out of the Fed paying $ 2.5 billion per year in interest on reserves. That's a pittance. All I'm looking for is some real world example where an economy came out of a liquidity trap situation nicely. Can you provide me with one? Our central bankers have lost their most powerful and well understood knob for tuning the economy - the short term interest rate. Models aside, we need a few examples of behavior when the economy is rudderless. What else do we have? I'm a new student of this and would like to look carefully at other case histories, so I don't ask this question rhetorically. "Krugman wants the Fed to buy more. Would this have any effect? Absolutely not. Swaps of reserves for private or public debt under the current regime (positive excess reserves) are essentially neutral (no effect on prices or quantities)." Why does this have to be a swap? Couldn't the Fed cut the interest rate on reserves to zero, and then just buy the longer term and private securities with high powered money it newly creates? Wouldn't that create inflation if done in large enough quantity? Some of my colleagues still talk of the possibility of a liquidity trap, in which the central bank supposedly has no power even to cause inflation... To which I say, pshaw! If the U.S. were ever to arrive at such a situation, here's what I'd recommend. First, have the Federal Reserve buy up the entire outstanding debt of the U.S. Treasury, which it can do easily enough by just creating new dollars to pay for the Treasury securities. No need to worry about those burdens on future taxpayers now! Then buy up all the commercial paper anybody cares to issue. Bye-bye credit crunch! In fact, you might as well buy up all the equities on the Tokyo Stock Exchange. Fix that nasty trade deficit while we're at it! Print an arbitrarily large quantity of money with which you're allowed to buy whatever you like at fixed nominal prices, and the sky's the limit on what you might set out to do. Of course, the reason I don't advocate such policies is that they would cause a wee bit of inflation. It's ridiculous to think that people would continue to sell these claims against real assets at a fixed exchange rate against dollar bills when we're flooding the market with a tsunami of newly created dollars. But if inflation is what you want, put me in charge of the Federal Reserve and believe me, I can give you some inflation. I was going to complain about the passage that Richard H. Serlin addresses, but his quote from Hamilton does that more effectively than I could have done. Hamilton's remarks seem completely decisive. Do you recant? 1. Unemployment is very high, which means equilibrium prices are much lower than current prices. 2. Therefore, people will anticipate lower prices and postpone consumption. 3. This will reduce equilibrium prices, causing people to anticipate even lower prices, which will cause people to postpone consumption, and so on. 4. The resulting equilibrium path, if there is one, involves many years (decades? centuries?) of excess capacity. 5. Make money sufficiently cheaper (i.e. raise the equilibrium price level), and you solve the problem. "comparing a duck to a goat"
A duck and a goat are both vertebrates with advanced nervous systems but no advanced linguistic capability. If there were only a few such species, it would be a very valid comparison. How many examples are there of nations where nominal interest rates have gone to zero? Did any of those cases turn out well? How does a 15-year sample wherein there is very little variation constitute any kind of strong evidence that the Phillips curve is not useful for forecasting inflation? You say: "inflation is also bad for well-known reasons"
Could you please quantify these reasons? If the choice is between 10% unemployment going down to 2% and inflation going up from 0.5% to 10% then how should I make my policy decision? I can clearly see the costs of 10% unemployment and one does not need any rocket science for it. But what is the cost of inflation being at 10%? Noone can answer this question yet somehow we are all made to believe that this is bad versus _all_ other outcomes. Simply because it is bad but not because it is worse. And then who makes this "worse" claim? Central banks which are unaccountable to the broad public on behalf of this public? "I hope I made clear that you should not take it literally as a policy recommendation." The Friedman rule comes out as the optimal policy in a surprisingly wide array of monetary models -- from cash-in-advance, to money search. As far as I can see, it is one of the most robust policy conclusions that one can find in all of economics -- and yet, so many macroeconomists consider it to be "an embarrassment". Jeremy Stein presented an interesting paper at the NBER Summer Institute yesterday, where he pointed to excessive private money creation as a key culprit for financial instability and vulnerability to financial crises. He was advocating various regulatory remedies, and his discussant (Mark Gertler) suggested Pigouvian tax remedies; however, all agreed that the entire problem would disappear if the Fed ran the Friedman rule. Arguably, then, from this perspective, the financial crisis could have been averted if the Fed ran the rule. It seems clear to me that financial institutions would prefer that the rule not be run (with zero nominal interest rates, it is more difficult to turn a profit by creating money that you then lend out). This, then, raises the question: what, exactly, is the Fed trying to achieve? One of the comments of one of the most senior (and respected) macroeconomists in the room was that banks act as if they "have the perspective of having a captured regulator". This triggered chuckles all around the room, but maybe it is time to think about this seriously. Please try to convince me that I'm wrong! I certainly take the Friedman rule seriously, just like I take Ricardian equivalence seriously, for example. It's a starting point for essentially everything we do in monetary economics. Further, I think there are good reasons why we should depart from it in practice - as I discuss above, I think this has a lot to do with the costs of operating a currency system. Someone sent me Stein's paper, but I haven't read it yet. As I think you're alluding to, there are many issues we need to think about regarding the role of the central bank - as regulator, lender-of-last-resort, and monopoly supplier of currency and payment system services. "Given that many people seem barely able to even say what country the U.S. declared its independence from, I am not so concerned with such sophisticated and forward-looking behavior occurring on a large scale." – the book, "Peddling Prosperity", 1994, page 208. Ricardian equivalence is an interesting idea to think about, and perhaps a small number of people think somewhat like this, so perhaps it's some minor force in the economy, but to think it happens on a large scale is to make some wild assumptions about the reality I've experienced and read about over a lifetime. To put together a chain of logic that it is not common requires anchoring to just really mild assumptions, much milder than even those depended on even in typical econometric tests. One should not base a policy recommendation on an assumption that people are stupid, or based on people behaving in a way that they will later regret. Thank you for your swift and thoughtful reply. Moreover, if the Friedman rule can avert financial crises (admittedly, this is a big if, but it has been advanced by credible sources) then the benefits of imposing the rule will likely dwarf the costs you mention. Again, this becomes an empirical question. However, as I expect we'll also agree, the results you would get from any such analysis will depend largely on the assumptions you make. In particular, what is the objective function of the Fed? Can we infer this from it's behavior -- or should we just continue to assume that it is benevolent? Игры рынка: I find that the easiest way to understand the financial crisis is to stick to the assumption that all of the actors in the crisis knew exactly what they were doing. You can be not stupid and still not extremely informed and educated on politics and economics. Few people are stupid, but the vast majority are nonetheless not extremely informed and educated on politics and economics. The evidence for this is mountainous. And believe me, I've taught and studied personal finance for a long time. So many people don't even consider the basics of personal finance, let alone a sophisticated analysis of how their personal tax burden may change in the future in response to political and economic events today. You can be not stupid without having extremely advanced education about things not in your career, and vast knowledge about things not in your career, and with a desire to spend more all too rare time with your family and on leisure, rather than getting all this education and knowledge and doing all this analysis to slightly improve your personal financial plan. Perhaps in some situations there might be some effect in the economy. Big deficits are really in the news, there's a lot of talk in the news about slow future growth, taxes will have to go up, then you may get some people thinking I better batten down the hatches and put more into savings (and then they have to actually have the self discipline to follow through), so maybe some effect, but hardly a 1-1, perfect effect like in models with extremely unrealistic assumptions. For my reading of the evidence of reality, I think this effect is minor at best. I find it easy to explain the crisis through private debt which was increasing during several decades due to neoliberal policies targeting inflation at the expense of labour income. Private sector leverage was also increasing due to insufficient injections of net financial assets by the government (read Clinton surpluses). In the end it all hit the wall when the Volker interest rate story reached its natural end and nominal interest rates were (are) not able any more to kick the can down the road. One does not need any big theory to understand the capacity of private sector to service its obligations. And if one adds re-distributional effects (of wealth) within private sector the whole story becomes crystal clear. Unfortunately economics profession was and is still living in its econometrics dreamland. Yes, americans do not know from which country they declared independence but economists believe that they alone can explain human behaviour because people are rational and maximize. No, people are not rational and they underestimate risks. There is empirical evidence (from the Fed and BoE) that QE affected interest rates and credit spreads. So I don't understand why you write that more, "Swaps of reserves for private or public debt under the current regime (positive excess reserves) are essentially neutral (no effect on prices or quantities)." Please can you explain? It is staggering how little sense Игры рынка makes. Yes, sure and neoliberalism can explain it all.. So why did it all happen then?